Eight people who work for training providers across Copeland were presented with certificates after achieving their NVQs Levels 3 and 4 in Advice & Guidance. 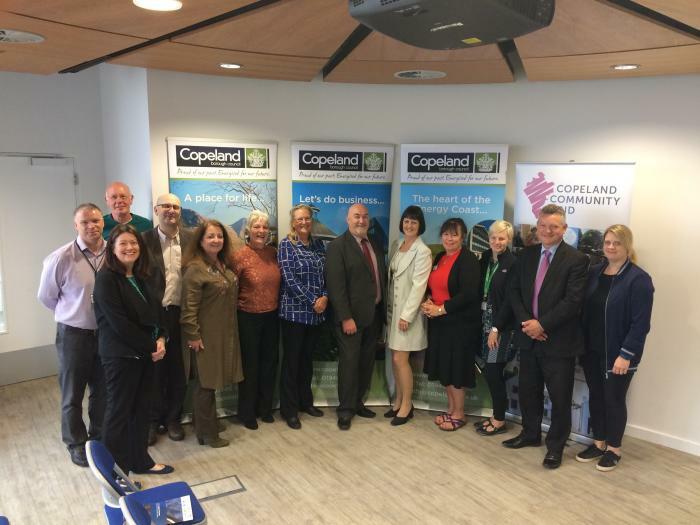 The project was part of the Copeland Work & Skills Partnership, which brings a host of organisations together to deliver projects in the borough. The learners who have successfully completed their qualifications are Alison Beard, Susan Watkins, Elizabeth Rothery, Lyn Osbaldeston, Alan Hurton, Andy Deacon, Carol Pugh and Nikki Greenaugh. Mike Starkie, Mayor of Copeland, presented the learners with their certificates at the ceremony held in The Beacon Portal, Whitehaven. Learners were then given the chance to share their experiences of the programme. Funded by Copeland Community Fund, the Work & Skills Partnership is led by Copeland Council and includes Lakes College, Skills 4 You, Jobcentre Plus, Phoenix Enterprise Centre, Citizens Advice Copeland, Inspira, Cumbria CVS, Gen2, Impact Housing, Howgill Family Centre, West Cumbria Works and Groundwork. The Partnership has published its Annual Review 2016/17, which highlights a host of success stories from the past 12 months. Overall, 82 individuals have been supported with employment and training opportunities, and more than 20 job opportunities have been created. David Moore, Chair of Copeland Community Fund, said: “It’s rewarding when you see events like the NVQ presentation, and the publication of the end-of-year report. To read the full document, visit www.copeland.gov.uk.